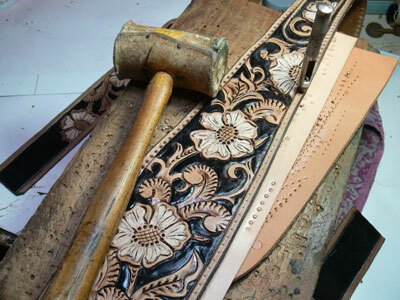 "Some" of the steps involved in making custom strap # 64. 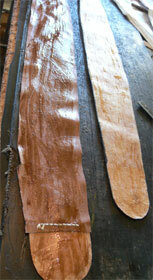 Those are only a few steps in the making of this straps, just a glimpse at part of the process. A whole series of time intensive steps are omitted here. 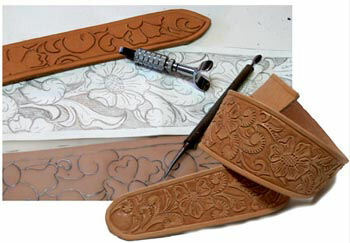 Once the strap is carved and embossed it is hand painted with a dye using an artist brush.and antiqued (again a whole bunch of steps have been omitted). Here you can see me applying an edge dye specially formulated for the purpose. It makes for a good finish. The lining is ready to be glued, complete with Kangaroo leather button holes reinforcement tips. The edge lacing holes are marked and punched out, one at a time. There is a certain sense of rhythm that develops after a while. 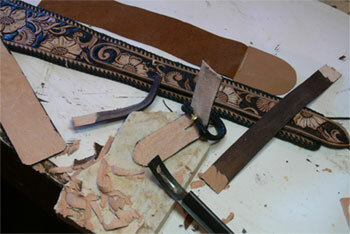 An important step in all good leatherwork here. All the leather parts that need thinning down for construction reasons and a proper fit get "skived" down to the right thickness of leather. I use a thickness gauge to give me an accurate reading on all button holes. 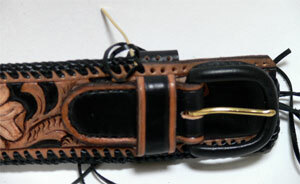 In this picture, the main part of the strap is now complete. 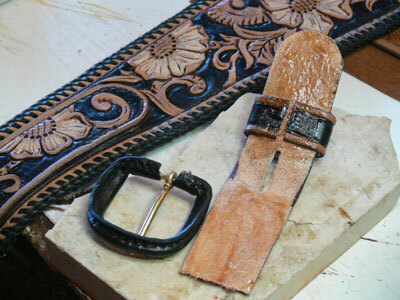 The Kangaroo covered buckle is ready to be glued and saddle stitched to the tail end. The strap keeper will be hand stitched into the side seam. This is the tail end of the strap. 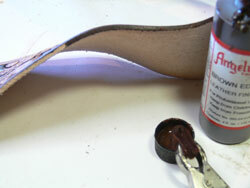 The buckle has already been saddle stitched to the top of the leather and it is shown in the process of been edge laced with kangaroo leather thonging.